Wigton completed a double over Fleetwood, who fell to a fifth successive defeat in the North-Lancs/Cumbria League. 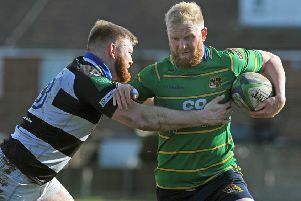 The home side’s tackling was not up to standard as Wigton mounted early attacks, though flanker Jordan Brocklehurst was prominent with ball in hand. And it was Fleet who opened the scoring as James Lilley’s quick tap-penalty created space for number eight Scott Richardson to break forward and beat several defenders. Centre Karl Bowling was on hand to finish off a well- worked try. The conversion missed but Fleet were 5-0 up with 10 minutes played. Wigton hit back almost immediately as they capitalised on their upper hand at the scrum for a close-range try which was converted to give them the lead. Centres Bowling and Brad Stapleton made good yards for the Green and Golds but all too often the ball was lost. Even so, Fleet regained the lead when a Wigton penalty failed to find touch. Young wing Alex Ogden broke and offloaded for Richardson to run through the defence for a try he converted for a 12-7 lead. The snow began to fall after half and hour, making visibility difficult, and Ogden was shown a yellow card for a deliberate knock-on. Now playing in glorious sunshine, Wigton’s dominant scrum resulted in penalty try as the lead changed hands again. There was another twist in the final moments of the half, Richardson picked up from the scrumbase deep in Wigton territory and his second try gave his side a 17-14 lead at the break. Wigton looked for scrums at every opportunity and drew level with a penalty early in the second half. Another handling error gifted Wigton another try, which was converted, and a penalty stretched their lead to 27-17. Now relishing every scrum, a rampant Wigton were awarded a second penalty try with little over 10 minutes remaining. Fleet responded as Bowling showed his pace to break before he sent flying wing Ogden in at the corner for a converted try. Bowling showed his class again to jink his was through for his second try which cut the gap to 34-29 but the hosts ran out of time. Wigton’s scrum had sucked the life out of Fleet, who also paid for their handling errors. Flanker George Orry tackled busily, with Rob Brookfield, Lilley and Rowell also impressive but Richardson’s work rate and tries earned him the man of the match honours. Fleet, who remain ninth with four to play, are at home to Trafford MV on Saturday seeking a first win since January. Fleetwood: Phillips, Ogden, Stapleton, Bowling, Kirton, Bamber, Rowell, Benny, Brown, Newton, Brookfield, Lilley, Jo Brocklehurst, Orry, Richardson; replacements: Ja Brocklehurst,Holme, Jones.